The pinnacle of high-quality vinyl — the Ultra High Quality Record (UHQR™) returns! Purest possible pressing and most visually stunning presentation and packaging! Analogue Productions, the audiophile in-house reissue label, together with Quality Record Pressings, is reintroducing one of the most revered brands in LP history — the Ultra High Quality Record (UHQR™), originally introduced by JVC Japan in the 1980s! 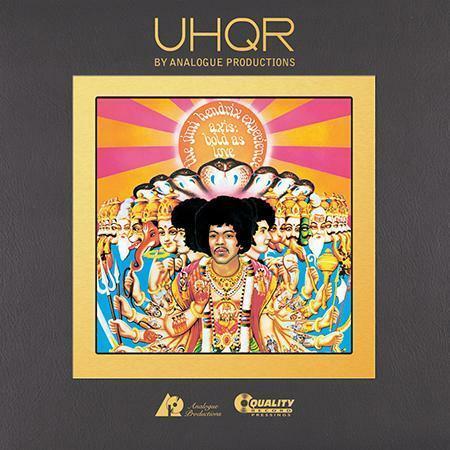 Analogue Productions presents its first UHQR™ title — Jimi Hendrix's 1967 masterpiece, Axis: Bold As Love, in both stereo and mono versions. 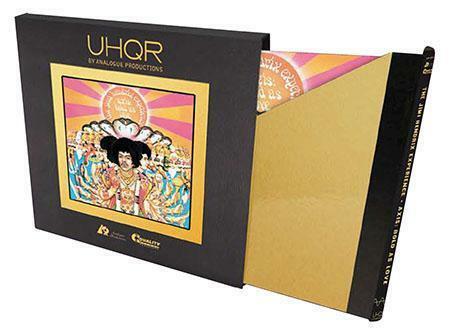 This UHQR™ is newly remastered by noted mastering engineer Bernie Grundman from the original analog master tapes. Each UHQR™ will be pressed at nt Quality Record Pressings (QRP) using hand-selected Clarity Vinyl® on a manual Finebilt press with attention paid to every single detail of every single record. The 200-gram records will feature the same flat profile that helped to make the original UHQR™ so desirable. From the lead-in groove to the run-out groove, there is no pitch to the profile, allowing the customer's stylus to play truly perpendicular to the grooves from edge to center. Clarity Vinyl® allows for the purest possible pressing and the most visually stunning presentation. Every UHQR™ will be hand inspected upon pressing completion, and only the truly flawless will be allowed to go to market. Each UHQR™ will be packaged in a deluxe box and will include a booklet detailing the entire process of making a UHQR™ along with a hand-signed certificate of inspection. This will be a truly deluxe, collectible product. Each Axis UHQR™ will be available as two versions: mono and stereo. The stereo release will be limited to 5,000 copies, while the mono release will be limited to 1,500 copies. The deluxe box will be gold foil numbered. Axis: Bold As Love, the sensational sophomore release of the Jimi Hendrix Experience, showcased Hendrix's expansive experimentation while acknowledging his early R&B and soul music influences. The album features classics such as "Spanish Castle Magic," "Little Wing," "Castles Made Of Sand," and "If 6 Was 9." As Rolling Stone states, Jimi Hendrix was the most innovative instrumental genius the rock era produced, a wizard guitar player whose sense of technique never overwhelmed the blues and rock 'n' roll spirit that was the underpinning of his genius. He improvised with the fervor of a born jazzman; he philosophized like the most cosmic rocker, but ultimately his basics were rooted in soul, a reflection of the chitlin circuit, where he cut his teeth. With the possible exception of Cream, The Jimi Hendrix Experience was debatably the world's finest-ever power trio. Axis was a showcase for Jimi's brash, scintillating songs and the grasp that Jimi and his cohorts — Mitch Mitchell on drums and Noel Redding on bass — had on the studio technology at their disposal, and the lyrical beauty of Hendrix's guitar playing. Bottom line, January of 1968 brought Axis: Bold As Love to the U.S., an album that expanded Jimi's six-string flame with celestial clarity, and also brought his rapidly evolving songwriting gift to the fore. It was recorded at Olympic Studios in London by Eddie Kramer. This reissue was cut to lacquer by Bernie Grundman. The plating at QRP was directed by Gary Salstrom, master plating technician and QRP general manager. The Axis: Bold As Love UHQR™ will include a 16-page booklet featuring recording information from the sessions at Olympic Studios in London and an essay written by Brad Tolinski, former editor of Guitar World Magazine. As we set out to make the world's best vinyl record, we began by establishing a set of exacting standards to address all of the components that comprise an LP. We call our records made under these strict standards Ultra High Quality Records (UHQR™). Most audiophiles would understand that the list of critical components in UHQR includes recording, mastering, plating, pressing and quality control. But some may stop short of considering the raw material used to make the record: the vinyl itself. We did some research and learned some interesting things about the history of the iconic black vinyl record. The most compelling revelation to us was the fact that LP vinyl is not black in its pure state. The off-white color of the record you are about to listen to is the color of raw vinyl in its purest form (un-tinted vinyl). The black color you're used to seeing is a colorant called "carbon black" that was part of the original compound formulation used in old shellac records. As vinyl compound replaced shellac-based compound, carbon black continued to be used as a colorant. We've expected our records to be black ever since. To make the ultimate record, we decided to enhance sound quality by removing anything we believed could detract from it. Record styli vibrate (or jitter) on a microscopic level, and any particles of carbon black pigment that happen to be on the surface of the groove could introduce surface noise. By removing carbon black from our Clarity Vinyl®, we eliminate the possibility of noise contamination due to carbon black particles. Instead, your stylus is allowed to effortlessly slide down a glossy and silky smooth groove wall. When we purchased Classic Records, the brand name Clarity Vinyl® came with it. We're proud to have resurrected, refined and trademarked Clarity Vinyl®, the perfect canvas for our masterpiece: vinyl in its purest form.